A regular breeding species and migrant. The Western Kingbird was an uncommon species during the Minnesota Breeding Bird Atlas (MNBBA). As its name implies, the Western Kingbird’s breeding range is largely restricted to the western United States and southern Canada, from southeastern British Columbia east to southwestern Ontario. Although breeding densities are high throughout the Central Plains states, from North Dakota south through Texas, the highest densities are found in northwestern Texas and eastern New Mexico (Figure 1). Assigned a Continental Concern Score of 9/20 by Partners in Flight and designated a Species in Greatest Conservation Need by the Minnesota Department of Natural Resources. Medium- to long-distance migrant that winters primarily in Central America. An aerial insectivore that also gleans insects from foliage and dives after prey items on the ground. An open-cup nest constructed in the upper third of a tree or shrub. Various structures also are used, including utility poles, fence posts, and building ledges. Three active nests found during the MNBBA were built within electrical substations. Breeding distribution and relative abundance of the Western Kingbird in North America based on the federal Breeding Bird Survey from 2011 to 2015 (Sauer et al. 2017). A handsome bird as it perches erect on a barbed wire fence or a telephone wire, the Western Kingbird is on the eastern periphery of its breeding range in Minnesota. Roberts (1932) first reported observing the birds in Minnesota in 1879, when three pairs were seen near Brown’s Valley in Traverse County, right on the South Dakota border. In 1889 it was observed in Lac qui Parle County, and in 1893 it was observed in Pipestone and Otter Tail Counties. By 1898 Roberts considered it a common summer resident throughout the southwestern region. Its progression further north in the Red River valley occurred several years later and is described in detail in Roberts’s 1932 account. Briefly, despite visits by several notable naturalists in the late 1800s, including Roberts himself, the first report of the Western Kingbird in northwestern Minnesota did not occur until 1912. By then it already had established itself as a common bird in western Polk and Marshall Counties. It was first reported in east-central Minnesota in 1915, when a single bird was observed in St. Paul, and in 1927 the first report from southeastern Minnesota was documented in the town of Frontenac in Goodhue County. It would only be a matter of years, Roberts predicted, before the bird would become a prominent member of bird life in the “semi-prairie portion” of southeastern Minnesota. By the time his treatise on Minnesota birds was published, less than 50 years after the first Western Kingbird was documented in Traverse County, the species was considered an “abundant summer resident throughout the western prairie portion of the state.” By 1932, confirmed nesting records (nests with eggs or young) were available from seven counties that stretched from the southwestern corner of the state to the Aspen Parklands and included Grant, Jackson, Lac qui Parle, Marshall, Pipestone, Polk, and Traverse. An inferred nesting report (i.e., an adult feeding young) also was available from Murray County. Discussing the species’ widespread expansion, Roberts’ commented, “Only one other species has come from the west in recent years and established itself over such a wide area in greater numbers, viz., [the] Brewer’s Blackbird.” The eastward expansion was not limited to Minnesota. At the same time, observers were documenting the kingbird’s eastward expansion across several states south of Minnesota, including Arkansas, Oklahoma, and Texas, (Gamble and Bergin 2012). Perhaps more remarkable, particularly to birders familiar with today’s community of grassland birds, was Roberts’s observation that the Eastern Kingbird was about twice as common as the Western Kingbird, “but locally, here and there, the Western equaled or outnumbered the Eastern.” Seeing the Western Kingbird in such abundance would be a welcome sight today. Despite Roberts’s optimism about the species abundance, by the late 1960s, his young protégé, Walter Breckenridge, began to take note of the apparent decline of both the Eastern and the Western Kingbird. Comparing surveys he conducted in 1968 to those he and Roberts conducted in 1926, Breckenridge noted that the number of Eastern Kingbirds observed in 1968 was orders of magnitude smaller (9 birds) than the number recorded in 1926 (267). And although 109 Western Kingbirds were seen in 1926, none were observed in 1968. Agricultural pesticides, he speculated, were to blame. Three years later, in 1971, he collected additional data and concluded that the Western Kingbird was ten times more abundant in 1926 as it was in 1971. In 1926 one Western Kingbird was observed every 3.26 road miles; in 1971, one Western Kingbird was observed every 30.23 road miles (Breckenridge 1968, 1971). Green and Janssen’s 1975 account noted that the Western Kingbird’s breeding range had not changed significantly, but the bird was definitely less numerous than in the early 1900s. Their species’ range map excluded all of northeastern and southeastern Minnesota and much of the north-central and south-central regions as well. A few years later, Janssen (1987) believed that the kingbird’s breeding range had receded westward and had become quite limited in east-central Minnesota. Some years, he remarked, it seemed that large areas of suitable habitat were left unoccupied. His range map identified 20 counties where breeding had been confirmed since 1970. Hertzel and Janssen (1998) later added 7 more counties to the list. While conducting their statewide survey work, field staff with the Minnesota Biological Survey reported a total of 112 breeding season observation locations for the Western Kingbird, all within the species’ known breeding range (Minnesota Department of Natural Resources 2016). Only 2 of the records documented since the late 1980s were located in the east-central counties of Wright and Dakota. Then, during the MNBBA observers reported 166 Western Kingbird records from 3.0% (144/4,757) of the surveyed atlas blocks and from 3.3% (77/2,337) of the priority blocks. Breeding was confirmed in 20 blocks (Figures 2 and 3; Table 1). The birds were observed in 30 of Minnesota’s 87 counties, and breeding was confirmed in 11 counties. The MNBBA added 3 counties to the list of confirmed nesting published by Hertzel and Janssen (1998): Benton, Pope, and Roseau. The Western Kingbird continues to be absent in northeastern, north-central, southeastern, and south-central Minnesota. Local concentrations were found along the Mississippi River, from northwestern Hennepin County northwest to Morrison County, and along the Red River valley from Lac qui Parle County north to Kittson and Roseau Counties. Records were extremely rare south of the Minnesota River valley, with only 8 records in southwestern Minnesota and 1 record in Scott County (Figure 2). The Western Kingbird was too uncommon to produce a reliable predicted distribution map. In the past one hundred years, not only has Roberts’s 1932 prediction that the Western Kingbird would become a prominent member of the bird community in southeastern Minnesota not come true, the species has nearly disappeared from southwestern Minnesota. Its range has receded westward and its abundance has declined significantly. Outnumbered 2 to 1 by the Eastern Kingbird in the 1920s, the MNBBA records show the Western Kingbird is now outnumbered by the Eastern Kingbird more than 20 to 1. As noted earlier, the Western Kingbird’s eastward expansion across Minnesota was part of a much broader expansion of the species’ breeding range that began in the late 1800s and continued through the early 1900s. Records were even reported as far east as Wisconsin and Illinois (Gamble and Bergin 2012). Although quite rare, birds continue to be reported in both of these states today (Cutright et al. 2006; Reber 2008). At the same time, expansion also occurred on the northern periphery of the kingbird’s range as it moved into the southern region of Canada’s Prairie provinces. It was first documented in southern Manitoba, for example, in 1907 and soon thereafter was common throughout the southwestern region of the province (Bent 1942). The northern and eastern expansions were attributed to settlement. As farmers converted the western grasslands and eastern deciduous forests to a productive agricultural landscape, they also planted trees, constructed buildings, and erected fence lines and utility poles, all of which provided new nesting and perching opportunities for the birds. In southern Canada, biologists estimated that only 19–30 years elapsed from the time that trees were planted until the time that the Western Kingbird appeared (Gamble and Bergin 2012). Breeding distribution of the Western Kingbird in Minnesota based on the Breeding Bird Atlas (2009 – 2013). Summary statistics of observations by breeding status category for the Western Kingbird in Minnesota based on all blocks (each 5 km x 5 km) surveyed during the Breeding Bird Atlas (2009-2013). Summary statistics for the Western Kingbird observations by breeding status category for all blocks and priority blocks (each 5 km x 5 km) surveyed during the Minnesota Breeding Bird Atlas (2009-2013). The Western Kingbird inhabits a variety of open habitats, including grasslands, cultivated fields, pastures, oak savannas, and riparian areas that border these habitats (Figure 4; Gamble and Bergin 2012). Its two primary habitat requirements are the availability of open areas for foraging and scattered trees for nesting and perching. Farm shelterbelts, buildings, and outdoor structures located in an open landscape also are suitable. The string of MNBBA records that follow the Mississippi River from northern Hennepin County to southern Morrison County would lead one to suspect a strong correlation with riparian habitats. Perhaps the juxtaposition of the riparian corridor with the adjacent open landscape was an initial attraction for the birds. Nevertheless, six of the records, which reported on a total of seven nesting pairs, documented the species’ broad adaptability to the human-modified landscape. Three of the nests were in electrical substations, two were on power poles, one was within a platted residential development, and one was placed in a line of trees bordering a parking lot. Typical breeding habitat of the Western Kingbird in Minnesota (© Lee A. Pfannmuller). Data collected by the federal Breeding Bird Survey (BBS) were used to generate a Western Kingbird population estimate of 25 million breeding adults (Rosenberg et al. 2016). In 2013 Minnesota was estimated to support approximately 0.10% of the continental population (Partners in Flight Science Committee 2013). When that percentage is applied to the most recent population estimate, it yields a statewide population of 25,000 adults. Due to its low abundance a statewide estimate using MNBBA data was not generated. Lying on the eastern periphery of the species’ breeding range, Minnesota supports relatively low breeding densities of the Western Kingbird. An average of less than 1 bird is detected per BBS route in the state each year. Immediately west of Minnesota, North Dakota detects an average of 31 birds per BBS route. Throughout the entire Central Plains, the average was nearly 15 birds per route (Sauer et al. 2017). The few studies that have collected data on site-level breeding densities have documented densities ranging from 0.07 to 0.6 nests per ha (Gamble and Bergin 2012). 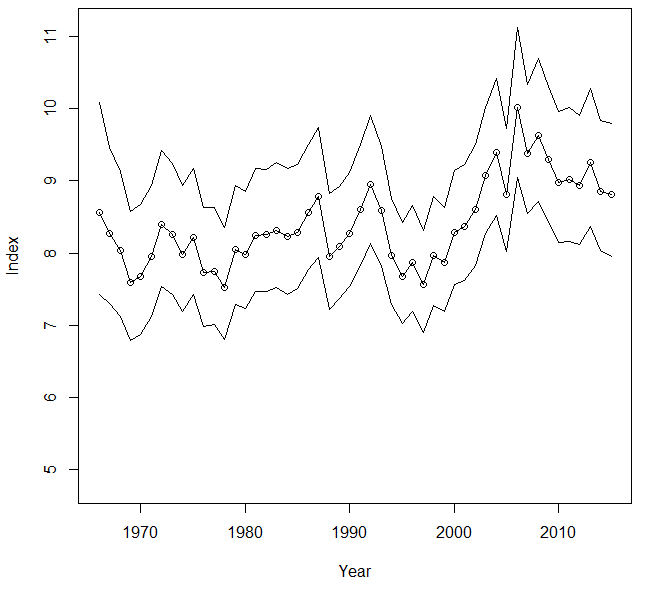 Survey-wide the BBS demonstrated a stable population trend for the Western Kingbird since its monitoring began in 1966 (Figure 5). Overall, since 1970, the continental population is estimated to have increased 20% (Rosenberg et al. 2017). At the smaller scale of individual states and provinces, data are quite variable: many sites report large, statistically significant increases, and many others report equally large, statistically significant decreases. As Figure 6 illustrates, most of the large increases (dark blue) are in the central and southeastern regions of the species’ range, while most of the large decreases (red) are in northeastern and southwestern regions (Sauer et al. 2017). Minnesota lies on the eastern edge of a broad area where the kingbird is experiencing significant population declines, stretching from southern Manitoba, through the northern Great Plains and south through the Central Mixed Grass Prairie Region. Because the species is relatively uncommon in Minnesota, the BBS state population trend line lacks precision but indicates a strong downward trend since 1966 that is mirrored to a lesser extent in Manitoba, North Dakota, eastern South Dakota and south through Nebraska and Kansas. Factors responsible for the species’ decline in Minnesota and other portions of its range are largely unknown. Gamble and Bergin (2012) reported that predation and weather are largely responsible for low reproductive success while human modifications of habitats spur population increases. In general, the species appears to have benefitted from habitat changes resulting from human settlement. Because it frequently feeds in heavily cultivated landscapes, the use of pesticides has been considered a potential threat, as Breckenridge (1968) speculated years ago. Yet at least one study documented that nesting success was not impacted by DDE concentrations in kingbird eggs (Gamble 1985). Although direct effects to the birds may be minimal, impacts to local insect populations could impact nesting success. Breeding population trend for the Western Kingbird in North America from 1966-2015 based on the federal Breeding Bird Survey (Sauer et al. 2017). Population trend map for the Western Kingbird in North America from 1966-2015 based on the federal Breeding Bird Survey (Sauer et al. 2017). In light of its relatively large, stable population and its broad distribution throughout much of western North America, the Western Kingbird has been assigned a moderate Continental Concern Score of 9/20 (Rosenberg et al. 2016). Although it is not the focus of any conservation effort at the federal level, its notable decline in abundance in Minnesota prompted the Minnesota Department of Natural Resources (2015) to classify it as a Species in Greatest Conservation Need. Specific management recommendations are limited to protecting and restoring riparian habitats, particularly in the western portion of the kingbird’s range. In the Great Plains states, the maintenance of farm shelterbelts, which provide important nesting habitat, is recommended (Gamble and Bergin 2012). Warming temperatures are considered a potential threat to many birds, particularly those dependent on North America’s Great Plains. Warmer temperatures, increased evaporation, increased precipitation, and more severe storm events are all expected to place additional stressors on grassland avifauna. The Western Kingbird’s adaptability may serve it well in an uncertain future. Nevertheless, a preliminary ranking of its vulnerability to climate change ranked it as moderately susceptible (North American Bird Conservation Initiative 2010). Bent, Arthur Cleveland. 1942. Life Histories of North American Flycatchers, Larks, Swallows, and Their Allies: Order Passeriformes. Smithsonian Institution Bulletin 179. Washington, DC: U.S. National Museum. Breckenridge, Walter J. 1968. “Where Are Our Kingbirds?” Loon 40: 56–57. Breckenridge, Walter J. 1971. “Our Disappearing Kingbirds.” Loon 43: 89–90. Gamble, Lawrence R. 1985. “Nesting Ecology of Western Kingbirds (Tyrannus verticalis Say) in the Trans-Pecos Area of Texas Relative to Pesticidal Contamination.” MS thesis, Texas A&I University.